16 | Th e M Rep o RT ExposurE A Special Look at the Five Star Single-Family Rental Summit T he Single Family Rental Summit featured high- level panels, exclusive keynotes, and exclusive net- working opportunities. Our reporter was on the scene to give you a glimpse into the highlights and takeaways of this inaugural event focused on the single-family rental market. 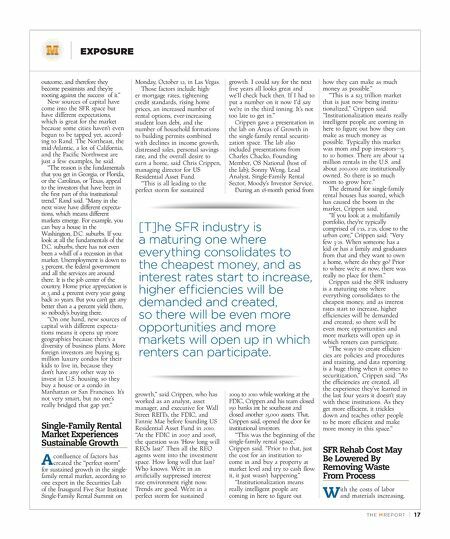 Expert Panel Examines Future of SFR Market O ne of the hot topics at a panel discussion at the Five Star Institute's Inaugural Single- Family Rental Summit in Las Vegas was whether or not the SFR market has the longevity to survive or if it's going to die out. The consensus among the many panelists over the two- hour Property Acquisition Lab is that the SFR market is here to stay despite some naysayers who still don't believe the market can survive despite so many compa- nies experiencing widespread success in the SFR space. "This is not a flash in the pan," said Greg Rand, CEO of OwnAmerica, a hosting sponsor of the Summit. "This is a permanent asset class." Rand, director of the Property Acquisition Lab, questioned the fact that the SFR market, despite experiencing what many are calling a "boom" in the last year or two, is still not generally recognized as a "viable" real estate market. "This is the first time I've ever been around for the birth of an institutional asset class, so I don't know how long it's supposed to take for the world to recognize its viability," Rand said. "To me, it should have been instantaneous. Maybe this is the way it was back in the early '90s when office real estate and retail real estate and industrial became institutional- ized. Maybe there were a lot of naysayers, and until it was proven beyond the shadow of a doubt it was going to be successful, people didn't get on board. Right now, the jury is still out for a lot of people who are watching from a distance. They're watching the stock prices or the public REITs, which aren't moving. They think because stock prices aren't moving, it's a dumb investment, and the asset class is not viable." The naysayers who do not believe in the longevity of the SFR market are simply not seeing the bigger picture, Rand said. "They're following seven companies, and those seven companies have stopped buying," Rand said. "They're not looking at the broader asset class; they're looking at the players in the asset class." "This is not a flash in the pan. This is a permanent asset class." The naysayers also consist of members of the media who do not have a desire to understand the market very deeply, Rand said. In fact, he said the business media has always been skeptical of the entire housing market, not just single-family rentals. "When the business media started talking about the housing market, it was always treated like an underdog. There was a huge amount of skepticism," Rand said. "The housing market was a meltdown, until it recovered. They're surprised it recovered. That was not a surprise. Then the market began to improve and the way the story was presented was 'Opportunity's over, the market is improving' as opposed to 'That was a good investment. The market is improving.' There are a lot of people for whatever reason are willing to proclaim that it's never going to work and therefore they anchor themselves in a negative Five Star Institute's Inaugural Single-Family Rental Summit october 11-13 | Bellagio hotel and Casino | Las Vegas I n October the Five Star Institute expanded its footprint in the burgeoning single-family rental market with its inaugural Single- Family Rental Summit in Las Vegas. Co-hosted by Investability and OwnAmerica, the Single Family Rental Summit provided the ideal educational and networking opportunities for private equity, REIT, institutional/bank, and small/mid-sized investors. 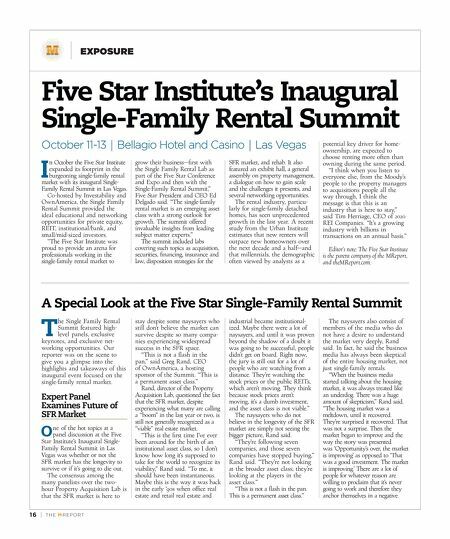 "The Five Star Institute was proud to provide an arena for professionals working in the single-family rental market to grow their business—first with the Single Family Rental Lab as part of the Five Star Conference and Expo and then with the Single-Family Rental Summit," Five Star President and CEO Ed Delgado said. "The single-family rental market is an emerging asset class with a strong outlook for growth. The summit offered invaluable insights from leading subject matter experts." The summit included labs covering such topics as acquisition, securities, financing, insurance and law, disposition strategies for the SFR market, and rehab. It also featured an exhibit hall, a general assembly on property management, a dialogue on how to gain scale and the challenges it presents, and several networking opportunities. The rental industry, particu- larly for single-family detached homes, has seen unprecedented growth in the last year. A recent study from the Urban Institute estimates that new renters will outpace new homeowners over the next decade and a half—and that millennials, the demographic often viewed by analysts as a potential key driver for home- ownership, are expected to choose renting more often than owning during the same period. "I think when you listen to everyone else, from the Moody's people to the property managers to acquisitions people all the way through, I think the message is that this is an industry that is here to stay," said Tim Herriage, CEO of 2020 REI Companies. "It's a growing industry with billions in transactions on an annual basis." Editor's note: The Five Star Institute is the parent company of the MReport, and theMReport.com.